Those mad scientists at DARPA (who previously brought us such curiosities as the Internet) are now actively engaged in research to produce semi-undead swine. 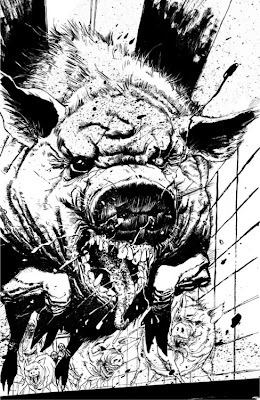 Yeah you read that right: the Pentagon is working on zombie pigs now. Before you reach for the nearest shotgun or chainsaw though, you should know that there's some practical applications being sought from this. The problem is severe injuries of military personnel in combat situations: massive blood loss from wounds that without immediate (and often nearly impossible) treatment leads to death or debilitating lifelong trauma that may stand a chance of being averted. So the eggheads at DARPA (Defense Advanced Research Projects Agency) are experimenting to see if a state of hibernation can be achieved in pigs, similar to squirrels and other mammals. If it can be made to work in pigs, humans could be the next step. Artificially slowing down brain and heart functions long enough to get an injured soldier to proper treatment could save many more lives from the battlefield.